Welcome to the USA Hockey Officiating Program's Registration section. A complete list of useful links are posted in the Officials Registration column in the drop-down menu under the OFFICIALS tab at USAHockey.com. A complete list of USAH registration rules and policies are posted at the Registration Rules page. We strongly recommend reviewing these rules prior to Membership Registration to prevent confusion and errors that might effect your registration for this season. A complete outline of the Officiating Membership Registration process and useful links are listed below. Thank you for your interest in the USA Hockey Officiating Program. Due to recent events we must preface our outline of the Registration process by mentioning that a few states have been experiencing conflicts with child labor laws. USA Hockey has no age restrictions for officiating; however in an effort to prevent people from registering and not being able to work due to labor laws we encourage you to contact your USA Hockey District Referee-in-Chief before registering with us. RIC contact information can be found using the appropriate links at the main Officiating Directory page under the Officials tab at USAHockey.com. Go to USAHockey.com. At the homepage you will click on “Become a Member” and register as an Ice Official. This is where you will provide us with your personal information for our database and pay your annual membership fee (and Affiliate Fee if applicable). Once you are registered, you will receive a registration confirmation email within 24-hours and a copy of the USA Hockey Playing Rules & Casebook (new officials and Rule Change Seasons only) within a week along with some additional information to help you along with the registration process. You will also receive a second email giving you information (including your USAH Officiating Number) relating to completing your online “Open Book Exam”. All officials who are 18 years-of-age or older must complete the United States Olympic Committee SafeSport training program. This online based program trains coaches, officials, and key volunteers in detecting and preventing detrimental behavior (hazing, abuse, etc.) off the playing surface. Once completed, the training certification is good for two years before recertification is required. This training must be completed in addition to your USA Hockey Local Affiliate Background Checks. SafeSport training can be completed by using the SafeSport link under the OFFICIALS tab at USAHockey.com. Once registered with USA Hockey, you will receive instructions regarding the online Officiating Education Module program. These modules are a mixture of required and elective topics that teach fundamental skills of officiating using video examples, animation, and knowledge-based testing. You must complete your required hours of training to receive your card and crest. You can access the Online Modules under the OFFICIALS tab at USAHockey.com. NEW FOR 2018-19: Returning Level 3 and Level 4 Officials may complete all elective module quizzes prior to completing module videos. Please use the video scroll bar to advance to the quiz. Go to the Open Book Exam page at the OFFICIALS section of USAHockey.com and follow the steps to begin your online exam. The exam is designed to allow you to go at your own pace. You may answer all questions at once, or answer ten questions every day until it is completed. Please review all answers before submitting it to the National Office. The exam will be accessible 24-hours after online registration, and we strongly encourage you to wait until you receive your Rulebook and attend your seminar (see below) before attempting to take the test. 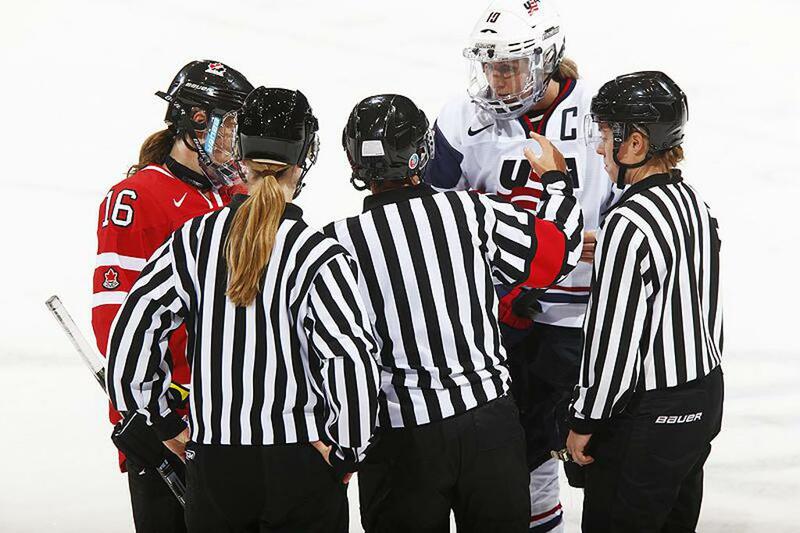 All USA Hockey Officials must attend a USA Hockey Officiating Seminar annually. To find one in your area, go to the Seminar Registration page at the Officials section of USAHockey.com. You will need a USAH Courses System profile to complete registration for a seminar (completing Membership Registration does not automatically create a USAH Courses Profile). Most seminars are scheduled between late August and early November (the schedules begin to appear online starting in July), and any questions about the seminars should be directed to your USA Hockey District Staff (following the links at the main Directory under Officials Materials). We strongly recommend you make sure you can attend a seminar before you begin the Membership Registration process (the fee is non-refundable), and do not wait long to register since some seminars do fill up very quickly. Once you complete these steps, and the USA Hockey National Office receives your Registration Fee, Open Book Exam answers, and Seminar Attendance confirmation, you will receive your USA Hockey Officiating Card and Sweater Crest and you are ready to work games. Important Note: Please be sure to record contact information for your local USA Hockey Supervisor of Officials and Local Assignor while at your seminar. Answers to other questions can be found in the Membership Information menu under the OFFICIALS tab at usahockey.com.